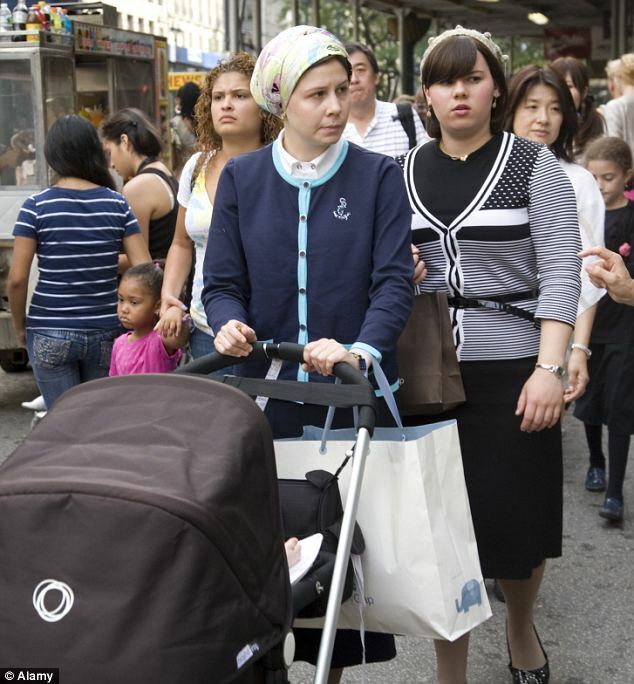 One of the biggest mistakes people make about the “Orthodox” is that we’re all the same. Or all Hasidic. Or all Joseph Liebermans. Well, just like lots of other things in life, it’s all about a continuum. Points along the spectrum. I will not attempt to speak for any of these groups, since I do not reside in all of them, but will instead offer very superficial distinctions between them. What I would love is to have members of these various groups speak for themselves, so if you identify as one of them, give me a holler and perhaps you would guest-blog for me. It may be anonymous, if you’d like. 2. Together with and separate from Hasidism is Chabad-Lubavitch. Chabad is a form of Hasidism, but their primary focus is outreach to fellow Jews to inspire them in Judaism, as opposed to insularity. Chabad is famous for stopping people on the street to perform a mitzvah such as laying tefilling or shaking a lulav and is incredibly idealistic, self-effacing, and devoted in their mission, even moving to far-flung areas such as (famously) Mumbai, Shanghai, or Chile to be there for fellow Jews searching for meaning, inspiration, or just a warm hello and some home-cooked kosher food. 3. We now arrive at the “yeshivish” community. They are easily spotted by the black hats, suits and white shirts at all occasions. More on the yeshivish community here. 4. The next group would be “regular” Orthodox. They don’t wear the black hats. They don’t only dress in “black-and-white” either. The guys might wear khakis, colored shirts, and jeans while in casual mode. The women are harder to distinguish from category #3. Good luck with that. Some people find themselves fluctuating between various groups, too, or living somewhere between. They may have a TV or allow moderate forms of secular culture in their homes and lives. 5. Modern Orthodoxy is a group that believes passionately in Religious Zionism, in embracing secular culture and being a part of the larger world for the purpose of creating a “kiddush Hashem” – showing the world that you can do both. Senator Lieberman, I believe, identifies as Modern Orthodox. What do you say, readers? Would you agree with my breakdown? Offer your own? Have something to add or subtract? Would love to hear about it! Per the nature of my blog, if there is disparaging or rude comment made about another group, it will not be published. Your Kid’s Hebrew Name is Yechezkel Simcha Chaim?? I’d like to thank Roni Sokol over at Mommy in Law for inspiring this post! 2. Do we pick a name related to the Torah portion? An upcoming holiday? 3. How will this name be spelled in English? 4. How will this child’s name appear on the birth certificate? 5. How will this name sound to people that are unfamiliar with Hebrew or Yiddish names? 6. How do we spell it? Child #1: Let’s pretend my daughter’s name is Esther. She is our first-born, and we decide to name her after my great-grandmother on my father’s side, who was killed in the Holocaust. There is a custom among Ashkenazic Jews that babies are named after deceased love ones, and that the first name goes to the mother’s side barring a pressing reason to name after the father’s side (like, father has no dad; mother would have to go back 3 generations). Great-grandma had two names, common among Eastern European Jews, but her middle name coincides with my mother’s name, who is very much alive and well, thank you. Just as it an honor to name after a deceased relative, it is SPOOKY AND NOT DONE to name after an alive relative. Unless you are a Sephardic Jew, in which case it is a BIG HONOR. So we ask her daughter, my grandmother, if she minds if we only use the one name. She’s great with it, as “Esther” is the name great-grandma was known by. Awesome. Esther is SO EASY. It’s Hebrew and English and phonetic to boot. And it’s one name. That simplifies life. “Esther” goes on the birth certificate. Daughter #1 is all set. Woohoo! Child #2 comes along – a son. This is a no-brainer, as my father passed away when I was six, so even though name #2 “belongs” to the husband, it’s obvious we will name this child for my father. Let’s pretend my father’s Hebrew name was Shlomo – one name, but it gets complicated. For one thing, it’s customary to add a name when you name after someone who dies young, so the newborn doesn’t have exactly the same “mazel” – fortune, sort of – as the deceased. We need to add a name. The classical Hebrew names that are added in such a case are Chaim (“life”) and Baruch (“blessed”), but my husband’s grandfather, who, at the time, was alive and well, thank you very much, is Chaim Baruch! So we choose a name – Nesanel (Netanel), which means “gifted by God.” So now our son’s name is Nesanel Shlomo. Second thing: my father was not exactly called by his Hebrew name, but was called by a Yiddish-flavored nickname of his Hebrew name – “Shloimy.” NOT PHONETIC. EASY TO MISPRONOUNCE. And definitely, er, ethnic. So we wanna call this kid “Shloimy” since it’s what my father was called, which is a very normal name in our community, but what do we put on the birth certificate? One name? Both? The Ethnic Nickname? We opt for simply (ha) “Shlomo,” which has since been mispronounced by every doctor’s office staff member since. Ah, well. Child #3: a girl. We have a choice of two great-grandmothers on my husband’s side. Finally, his turn. Both are Yiddish. We do some homework and find out that one was a classic Bubbie, a regular saint; and the other was a strong woman who retained her faith out in Scranton, PA. We opt for “saint.” My husband is scheduled to name the baby at the synagogue. I am in the hospital. It is Shabbat, so we are not communicating over the phone. After Shabbat he calls: “I didn’t name the baby… I just felt it wasn’t the right name!” Okaay – who am I to question my husband’s prophetic powers? I didn’t feel that strongly either way, so we go for name #2 – strong personality, Scranton, PA.
Child #4 is named after someone in the parsha. We didn’t have any urgent relative to name for and are married long enough that we don’t need to take turns anymore, and name after our Patriarch Abraham. Great – easy, right?? EVERYONE knows Abraham Lincoln! Yes, except his Hebrew name is Avraham, and his nickname shall be… Avromi. So how easy is it to mispronounce “Avromi’? Answer: very. It’s pronounced “Av-RUH-mi” (Ruh as in Run). But some people, like Jews from more Chassidic backgrounds, like my grandparents, pronounce it “Av-ru-mi” – Ru as in the way a Bostonion would say “roof.” Or those that are not comfy with Hebrew or Yiddish say Ru like “rah rah rah! Sis boom bah!” Ah, well. Oh, and we decided to be “smart” and put “Abraham” on his BC so everyone will be able to pronounce it… now he just seems like a relic from the 1800’s. Really? Your name is Abraham, and you’re… 10? Not 89? Ah, well. Also: since we did not reach back multiple generations for a name we had some explaining to do to family members… ’nuff said. Child #5: girl. We decide to name after my great-grandmother Mindy. She also had another name, which coincided with my husband’s grandmother’s name. (Anyone want to become a Jewish Baby Naming Coordinator? I’ll send you lots of clients.) Yes, I know my side of the family is seriously winning, but I already told you, we’re done taking turns. Also I just happen to have more dead relatives – sorry. We ask my grandfather (she was his mother) how he feels about us just using one name and he is fine with this since she was called “Bobba Mindy” and that’s how everyone knew her. Can I just emote for a moment? I LOVE THIS NAME. It has everything I need! It’s named for someone I knew and loved, it’s easy to say, spell, and pronounce, and I can put the nickname right on the BC since we are now living in America and I don’t have to travel anywhere dangerous moments after giving birth to obtain a BC! The lovely, nice hotel – er, hospital – does all the hard work FOR YOU!! Yay! Mindy Koval. Love. Child #6: Boy. He is born 10 days late, on his great-grandfather’s yahrtzeit. Like, exactly, on the Hebrew date. Did I say “chose a name”? I think the name chose us. This name does not fit the profile of my perfect name. It’s Hebrew and Yiddish, two names, neither of which are phonetic, nor easy to say, spell, or pronounce. Yay! Well, we go mostly with the first name and just plunk that Hebrew name right on the BC. And if no one can pronounce it… it’s their problem. Lots of cool people have weird names (Gwyneth?). Child #7: Girl. When you get to this number of kids, my philosophy is you pick a name you just LIKE. You’ve earned it. We picked the name first (Nomi) then prayed for her to be born on the holiday that coincided with her name. And… she was! Can I just emote for a moment? I LOVE THIS NAME! For all the reasons I love Mindy, but one more added bonus: It’s not a nickname but the real name. However, even this name was not hitchless. The REAL name is “Naomi,” and is pronounced in truly grammatically correct Hebrew as “Na’ami,” and is still pronounced a variety of ways by my relatives. Nevertheless, it’s super easy to spell and read, and we love it. So far, it’s the only low-maintenance thing about the child, so that’s a good thing. Was it hard to pick out your kids’ names? What did you have to take into account? What did you choose for their birth certificates – have you regretted it?